Sunderland AFC Ladies players Bridget Galloway and Keira Ramshaw. 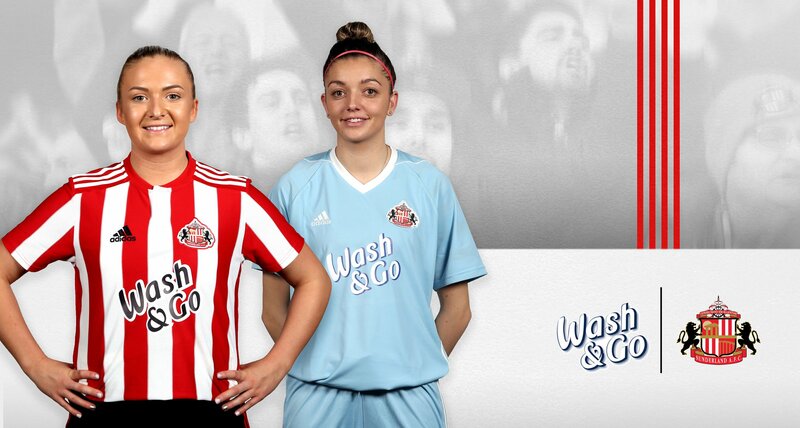 Sunderland AFC Ladies’ shirts will include the Wash & Go logo for the remainder of the FA Women’s National League Northern Premier Division season. Their first game sporting the Wash & Go name on their shirts will be on Sunday 17 February, when they welcome Hull City to the Hetton Centre. Peter Reynolds, senior marketing manager from Wash & Go, said: Wash & Go is proud to support Sunderland AFC Ladies – a team who have faced some challenging times recently. We are delighted that they will sport our logo on their famous red and white shirts and hope our support can play a small part in the growth and development of the team. To kick off the partnership, Wash & Go are offering fans the chance to win one of 25 pairs of tickets for Sunderland’s game with Hull met Sunday in a special competition.